Rebar Modern Food is an institution in Victoria, on Vancouver Island, BC. It has an almost cult following of vegetarians and meat eaters alike. And, given that it only serves vegetarian or vegan food, this is a big call. But, for those that don't have the time to make it to Victoria for a Rebar fix, there is a solution, and that is the Rebar Modern Food Cookbook. With more than 250 recipes, the book is a hefty addition to the culinary portion of your book collection. And, as with the restaurant, the recipes are all either vegetarian or vegan. But do not fear meat eaters, these recipes take lentils, tofu, fresh vegetables and grains and mix them and match them in a way that will make you think you might never eat meat again. Another handy thing about an entirely vegetarian cookbook is that you will always have a recipe for dinners, lunches and brunches for your carrot-munching friends. Even more handy is that the vegan recipes are identified as such, making catering for vegan friends a much easier and simpler task. And, these recipes will not disappoint eaters of any variety. One thing that cookers will notice immediately about the Rebar Modern Food Cookbook is that it contains no images. In fact, the contents of the book is entirely in black and white. Gasp and horror I hear you say - no pretty pictures to inspire me to cook! But, this feature of the book, I believe, works in its advantage. The reason is that cooks will have no pre-conceived notion of how their creation is supposed to look, and therefore it will always be a success (provided they follow the recipe correctly of course). And, without a doubt, Rebar recipes will definitely work out if they are completed as described. If not having pictures of the food makes you worry about not being inspired to cook, think again. The recipe names are so enticing, and the ingredient list so obviously fresh and healthy, you will be jumping at the chance to start experimenting with each and every selection within. Another interesting feature of the Rebar Modern Food Cookbook is that it provides instructions on how to prepare all the basics required for its recipes in a separate section. For example, roasted garlic, vegetable stock, and many other foundation items are all explained in detail. These basic recipes can also be adapted by experimenting cooks into other items in the own repertoire. 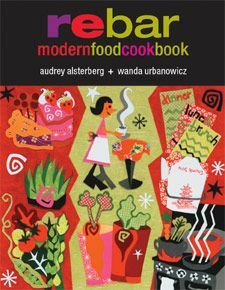 In all, the Rebar Modern Food Cookbook is a must on every aspiring chef's shelf. The recipes are innovative, inspiring, healthy and delicious. And, for a price tag of only $29.95, the book will pay for itself after one dinner party. « Asia's Feral Dog Problem. Season's don't fear the reaper.